Here is the English version of our teaching philosophy. The legally binding text is the German text below. Since it’s a long text, perhaps you prefer to download the PDF of Zebra’s teaching concept in English or the German version German version of the concept PDF. The idea to found a bilingual German-English parent initiative Kindergarten occured in early 2002. A group of families shared the common feature of having at least one native-English speaking parent. They wanted to provide their children with the opportunity to learn the English language and the culture of anglophone countries. Since that early stage, German-German and other mixed-language families have joined us. The society, Zebra International Kindergarten e.V. Berlin has an establishment in the east of the city and has given itself the task of fostering bilingualism from infancy. Unity with other people exists where emphasis is placed on globalisation, European Union policy and a multicultural society. The tool to achieve this is communication. The early imparting of a second language will be a key skill, and attribute, in realising that communication. Recent research has convincingly shown that the early acquisition of a second language supports cognitive development and native language learning. Language skills create not only opportunities in school and later in a career, but also support personality and character development. Humans have the learning-capability to acquire more than one language. Every child, therefore, has the necessary capacity to learn bilingually. Through the experience of authentic multilingualism, children will be prepared for the Europe, indeed the world, of tomorrow. Additionally, multilingualism incites tolerance for people from other cultures or those who speak different languages. Furthermore, multilingual children are more verbally and cognitively capable in the long-term. We consider a second language to be a gift that we do not want to leave unwrapped. The Prenzlaurberg/Pankow district is particularly popular with young families and is the city district where, proportionally, the most children reside. Inquiries regarding bilingual kindergartens in the eastern part of Berlin are steadily increasing. Parents do not want to do without such an option. They have reluctantly travelled long distances to other parts of town for bilingual kindergartens and had to pay high fees. Happily, four bilingual parent initiative kindergartens have been created in the last two years with Spanish, French or English as the second language. Unfortunately, these kindergartens have long waiting lists with up to 90 families hoping for a place for their child. Zebra International Kindergarten hopes to improve on that by offering a bilingual “German-English” education flexibily based on the teachings of Maria Montessori while borrowing from other teaching methods. This offer is available to bilingual families, English-speaking families or all-German families who want their child to learn English and German and about the sometimes-complex cultures that spring from these two languages. 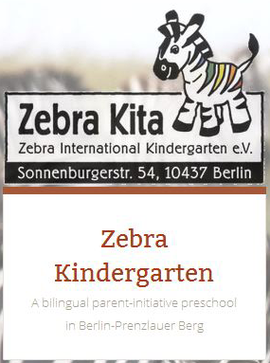 The philosophy of Zebra kindergarten, or Kita, is that children should learn the second language as easily as possible. It can happen through daily communication from about the age of 18 months or as soon as the child begins to talk. We use the immersion method. Immersion means literally a language “bath”. It is focused on language communication in daily activities. The teachers and children can use gestures, signs and pointing to make themselves understood. Each teacher uses only their mother-tongue when they speak to the children. To reinforce English in a German environment, the teachers speak English amongst themselves. For such a project to succeed, the class should not have more than 30 percent German-speaking children. At least 70 percent of the children should be from bilingual or anglophone families. Learning and using a second language is an educational advantage like any other, such as sport, music, etc. The evolution of a child’s mother-tongue is something that will never be harmed by learning a second language. There is no question of forcing a child to speak or study a second language. Interest in this second language and communication has to be encouraged through games. At the heart of the pedagogical principals is the development of the child’s personality — “help me to help myself”. The teaching method and way of behaving toward the children are inspired in large part by the experience of the doctor, psychologist and teacher Maria Montessori. A specially thought out environment, a social-emotional apprenticeship and a careful choice of educators contribute to this goal. In education, emphasis should be place on the notion of free development, which is based on freedom of movement and free choice of intellectual stimulous. The materials must stimulate long-lasting activity. This is only possible if they can be used at more than one level of learning. Aesthetics: the aesthetics of the material should entice the child to pick it up and do something with it. The material must be attractive and complete but also presented in an appropriate, pleasant manner. Limits: there must only be one of each object. This imbues it with a particular value, which helps the child learn to wait patiently and sustain a desire for the object until another child has finished using it. Self-control: the foundation of children’s independence is their capacity to recognise mistakes. Self control is the path toward independence and a first step in understanding how events unfold. The materials must arrest all the capacities of the child. Intelligence, willpower and feelings must be stimulated by the senses, touch and also movement. the children’s activities vary depending on the seasons and are divided into thematic units. there are main thematic units divided into weekly blocks. the thematic unit for the week will be prepared in advance as well as the activities undertaken to develop it. In autumn — holidays: Halloween, Thanksgiving, Erntedank, etc. The children will learn the cultural background to these occasions. Advance preparation will be made for them. Excursions to collect leaves. Observation and contemplation of nature, with adapted reading materials. A leaf press could be made. The noises and colours of autumn. Painters and autumn; the children could paint autumn themselves. The noise and atmosphere of trees in autumn can be recreated through music. The sounds of wind, raindrops and rustling leaves can be imitated. What do forest animals do in winter? What fruits and vegetables grow in winter? We’ll make things out of pumpkin and prepare for Halloween. The integration of holidays and annual events is another important part of our planning. Marking German holidays and those of anglophone countries is an important door to other cultures. In this way, children can learn about the history and customs of a country and take a new step in learning tolerance. Learning in this domain will be greatly helped by mixing age groups and using different teaching models. The rules and rituals will be learned together or fixed in advance, depending on the situation. They will determine how the children will interact and behave, and the orderly manner in which the work will advance. The rules must be understandable, provide points of reference and fix limits for the child. When they are broken, the children will be encouraged to resolve any conflict among themselves. Within the framework of free exercise, the children are free to choose whether they want to work alone, in pairs or groups. They will thus learn how to organise, express their desires and look for alternatives when another child is using the material they want. At the same time, a system of inter-aid develops: the more experienced children, those who are like mini specialists in an activity, help the new comers and can sometimes replace the teacher. Each child is considered an individual. Diversity should be actively encouraged within the different activities. At the same time, values like tolerance and mutual respect are also encouraged. Morning and evening assembly are an important part of our philosophy. The group should be seen as a community, and the child part of that community. Children will be particularly encouraged to take part and talk about their recent experiences. A regular, profound exchange between parents and teachers will contribute greatly to the success of the teaching philosophy. This demands regular parent evenings prepared and conducted by the teachers but also an exchange of written notes and short discussions when parents come to pick up their children. The teachers will prepare a group book in which events of the day are recorded, such as big arguments or extraordinary actions of any children, or any accidents that might occur and which the parents can consult. Attention will be paid to ensure that the notes are written in a language that will be clearly understood by the parents. All the teachers are equals and part of a team. Regular team meetings will be held where conflicts and differences can be frankly discussed, the progress of the children evaluated and solutions to any problems proposed. Through their exemplary conduct, the teachers must help break role stereotypes. The staff have the right to take part in decisions affecting the organisation of the group (new children, restructuring) and any decisions made about selecting new staff or interns. Network: Zebra Kita aspires to undertake exchanges with other bilingual day care centres which face the same challenges: the practical aspects of bilingualism, the particularity of bilingual children, the children’s continued education, etc. This exchange will also provide an opportunity for the teachers to meet colleagues who face the similar challenges. Parents play a particularly important role at Zebra Kita. They are not only responsible for organisational matters, they must also take part in defining the way their children are taught. Teachers and parents decide together the educational framework and the way it will be taught. The child must not have the impression that home and the kita are two separate worlds. Parents, as much as possible, will contribute to the themes being studied. Eg: by bringing relevant books or materials. They will organise parties and take part in planning and running excursions. Each parent is encouraged to bring their unique talents to bear in the education of the children. This can be reading, gymnastics, singing or music. The parents and teachers are a team. Zebra International Kita is managed by a society of the same name. The rules, or statute, governing the way the society is run are set down in a constitution. Parents whose children participate in the Kita must also become members of this society and accept its rules. When the child arrives, a contract is signed by the parents setting the conditions for entry and the legal details. This concept is part of that procedure and parents must show they have read and accept it when they sign the contract. The society will choose among its members three people who will make up its management committee for one year. The committee will represent the society in matters concerning the Kita in the outside world, including dealing with the German authorities. Organisation, communication outside the Kita, questions concerning the society and meetings, finances and the work undertaken by the parents. It will meet at least once every two months. Members of the society will hold a general assembly at least once a year to resolve any important issues. Specific questions concerning the work of the teachers will be discussed during parents’ evenings, which should be held on average once a month. The Kita can only be financed with the help of the Senate. However money put forward by the Senate is unlikely to be sufficient and parents will have to contribute a certain extra sum each month. The amount will be decided in accordance with the members of the society. The Kita is open Monday to Friday from 8:00 am to 5:00 pm. It will be closed on German federal public holidays and those of the state of Berlin. It will remain open on anglophone public holidays. It will be closed for two weeks during the summer vacation period set down for schools by the state of Berlin. Parents must notify staff as quickly as possible about the absence of their children due to illness or in case of additional holidays. For planning reasons, it is highly advised that this notice be given well in advance. After two weeks of unjustified absence, the contract will be automatically broken at the end of the following month. It is important that children arrive at the Kita in the morning no later than 9:00 am so that the day’s schedule can get underway. If the morning assembly has already begun when a child arrives, teachers will not be able to take charge of the children and parents will have to wait with the child until it is finished. The children should be picked up no later than 5:00 pm. If another person is to collect the child, parents should give advance written authorisation to the staff. The children will eat nutritional and organic foods. Sweets or lollies are not welcome. At the time the children first enter the Kita, parents should inform staff of any allergies or other health concerns and where ongoing medical treatment or medication is required. has a fever of 38 degrees or more. The Kita respects the laws set down by the health authorities concerning the need to signal any contagious diseases and respect quarantine periods. Parents will be informed as soon as any such illness is detected.Should a member of the child’s family or someone living with child contract anything contagious the Kita should be immediately informed. If a child falls ill at the Kita, he or she will be isolated from the others and the parents will be informed. Parents of ill children are expected to take them home as quickly as possible. In the case of injury, first aid will be given by the staff. If the injury is minor the teachers will write a report in the group book describing what happened and the parents will be informed when they come to collect the child. In the case of any head or serious injuries, the parents will be informed immediately after first aid is administered. If necessary a doctor or paramedic will be called. The rooms respect all requirements laid down by the Berlin Senate. Emphasis will be placed on using ecological materials and toys.